Sen. Larry Taylor on Monday filed Senate Bill 3, which pushes education savings accounts and tax credit scholarships to subsidize private school tuition and other education expenses. One of the most anticipated debates of the 85th Legislative Session began taking shape Monday with the layout of a two-part Texas Senate bill that would allow for Texas taxpayer dollars to be used to help parents send their kids to private or religious schools. Senate Bill 3, filed by Senate Education Chairman Larry Taylor, R-Friendswood, would establish the creation of two voucher-like programs that some parents could combine to subsidize the entire cost of private school tuition. The first half of the bill proposes education savings accounts, or ESAs, which give Texas parents public money to spend on private K-12 school tuition and education-related expenses, including tutoring, technology, textbooks and special education services. Five states have implemented the program so far, mostly for students who have special needs. The second half of the bill brings back a proposal for tax credit scholarships, which was hotly debated during the 2015 legislative session. The tax credit scholarship program would allow businesses to count contributions to approved scholarship organizations as credit against their insurance premium tax. "This is not money leaving the system. It is money following the student," Taylor said Monday at a Capitol news conference announcing the legislation. 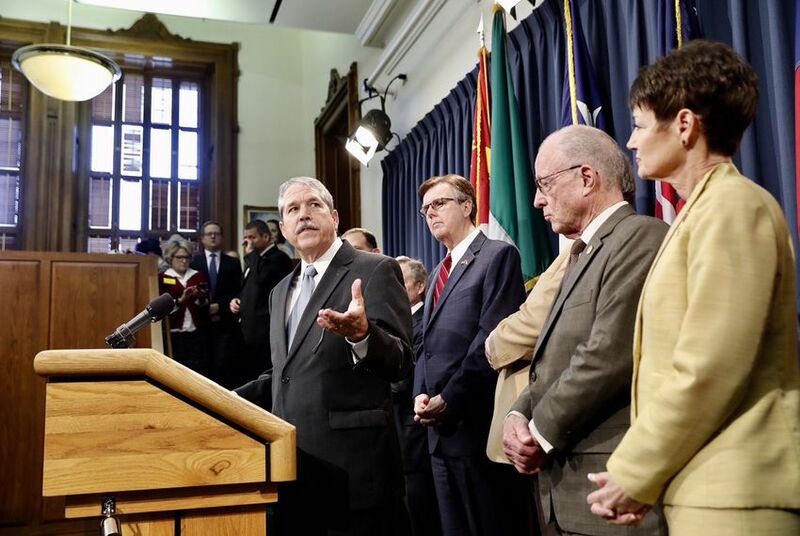 "If Texas wants to remain economically sound ... we need to pass school choice legislation to give all of our students the opportunity to receive a great education that is tailored to their specific needs," he added. Lt. Gov. Dan Patrick, a former Senate Education Committee chairman, has championed private school choice legislation since his first session as a state senator in 2007. He said Tuesday that 13,000 to 15,000 students would be able to take advantage of this funding, if the bill passes. At last week's National School Choice Week Rally, he called on the House to take a vote on the upcoming bill. "It's easy to kill a bill when no one gets to vote on it," he said. At the same rally, Gov. Greg Abbott said he looked forward to signing the bill once it reaches his desk. "I hope and I urge that that law reach my desk. And when it does, I will make the choice to sign it and authorize school choice in the state of Texas." Last session, the Senate approved a tax credit scholarship bill, but the House did not bring it up for a vote. Students in families of all income levels would be eligible to access the education savings accounts. Low-income students would receive 75 percent of average state operational costs per student. Students above the poverty line would receive 60 percent, and students with disabilities would get 90 percent, according to the bill. Taylor said students' home districts and the state would share the portion of funds left over, leaving schools with more money to educate fewer students. To use the education savings accounts, students must be currently attending public school, or looking to attend private school in kindergarten or first grade. The tax credit scholarship program is more restrictive, allowing just the most vulnerable students up to 75 percent of average state operational costs per student. Students can use scholarships for private school tuition and other education expenses, if they are in foster care, need special education services, have family in active military duty, or are below the poverty line. They must be enrolled in public school, starting school for the first time, or be the sibling of a student who is eligible. The scholarship program would also provide up to $500 for students who want to stay in the public school system and pay for extra academic support, including tutoring and transportation to other districts, Taylor said Tuesday. The total amount of tax credits allowed in the 2018 fiscal year would be $100 million, and the cap increases by 10 percent each year. Low-income families could combine the two programs, Taylor said, to make up the difference for private school tuition and transportation costs. "Only a small percentage of families will take advantage of these programs, because most families want to stay in the public school system," Taylor said. "Parents really need to want something else in order to leave." Critics argue that school choice measures like education savings accounts divert public money to private schools, with no accountability, and exacerbate school funding inequities. Proponents say the accounts could help ease excessive enrollment at "failing" public schools by subsidizing parents who want to take their students to schools outside of the public system. Patrick has linked "school choice" policies to the state's new A-F rating system for schools and districts. "No parent should be forced to send their child to a school that's a D or an F or a C, or frankly any school that they don't think serves their child," he said earlier this month at a forum hosted by the Texas Public Policy Foundation, a conservative think tank. At the same forum, U.S. Sen. Ted Cruz encouraged the Texas Legislature to "step up and lead and help lead the nation on school choice." All parents, no matter the income level, should be able to use the education savings accounts, said Vance Ginn, an economist the Center for Fiscal Policy at the Texas Public Policy Foundation. "No matter your income, if you're paying property and state taxes...why shouldn't they have the opportunity to go to whatever school they choose," he said. "Once you add in competition, it increases student outcomes across the board — and public school outcomes." Opponents immediately released statements against the bill Tuesday. Charles Johnson, executive director of Pastors for Texas Children, said parents should not be allowed to take their tax money back, if they choose not to send their children to a public school. "We believe public education is a basic provision of the social contract," he said. "Anything that releases us from that public trust to the benefit of a few should be opposed." "SB 3 is a school voucher on steroids. It marries a taxpayer-funded government subsidy for private schools and vendors to a corporate tax break with little public oversight and no accountability for results," said Alison Badgett, executive director of education nonprofit Raise Your Hand Texas. “This is an attack on public education that will harm the vast majority of Texas school children in order to benefit a few private and religious schools, and it may allow a few homeschoolers to purchase new family computers at taxpayer expense,” said Noel Candelaria, president of the Texas State Teachers Association. Senate Bill 3 is one of a few voucher-like bills this session that would have taxpayer money follow students to private schools and homeschooling. State. Rep. Ron Simmons, R-Carrollton, proposed House Bill 1335, which would create education savings accounts allowing parents of special-needs students to pay for private school, special education services, and other education expenses. Other states with education savings account programs started by limiting them to students with disabilities. The Texas Catholic Conference of Bishops and the Texas Private Schools Association are pushing tax credit scholarships in separate bills -- Senate Bill 542 and House Bill 1184. Students with high academic and financial need could use those scholarships at any accredited private or parochial school, similar to Taylor's bill. But those bills do not include education savings accounts. "When it comes to an education savings account, we're a little more cautious. We see potential there. We're a little more cautious because we haven't done it," said Jennifer Allmon, executive director of the Texas Catholic Conference. At a "National School Choice Week" rally Tuesday, Lt. Gov. Dan Patrick and Gov. Greg Abbott urged the Legislature to take a vote on school choice legislation this session. Longtime GOP political operative John Colyandro has been tapped to head a new organization that will aggressively push Texas lawmakers to approve education savings accounts. In a bipartisan sparring match, members of the House Public Education Committee challenged proponents of using taxpayer dollars — or tax breaks — to help parents send their kids to private or parochial schools. You can slow down or even kill a piece of legislation with a single word or phrase, if it's poisonous enough. Disclosure: The Texas Public Policy Foundation, Raise Your Hand Texas and the Texas State Teachers Association have been financial supporters of The Texas Tribune. A complete list of Tribune donors and sponsors can be viewed here. Correction: An earlier version of this story misidentified Charles Johnson, executive director of Pastors for Texas Children.